Seaward Kayaks will be shutting down for it's annual vacation and seasonal clean up. Our produciton shop and offices will be closed on July 25th returning August 8th!! We hope everyone is enjoying the paddling season, and we might see you out on the water!!! 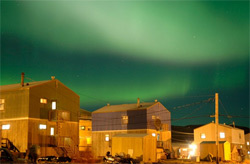 Angelo Wilkie Page, Expedition 720, is preparing for his crossing from Alaska, to Russia. The whole team at Seaward Kayaks, is proud to have been a part in building his custom, Passat G3, being shipped out next week! Wishing Angelo a safe journey. Wishing everyone the best of the Holiday Season. May your Holdiays be merry and bright!! 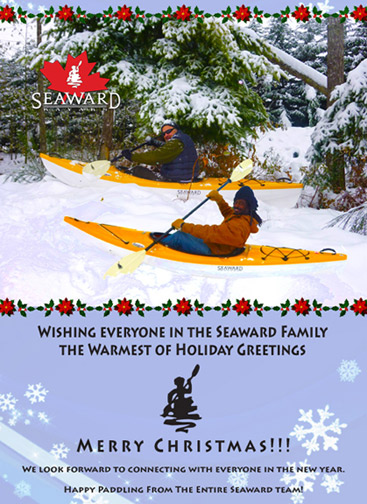 Seaward Kayaks will be closed for business December 23, 2015 thru January 4, 2016. The "New" for 2015, Seaward Mantra makes its maiden voyage and debut with Dave Luther, from Duncan. Congratulations Dave, looking great. Mantra dimensions as follows: 13ft 6" long. Cockpit 18" wide X 36" long. Depth front of cockpit 14". Big News friends! Seaward Kayaks pitch to the Dragons will be airing on Wednesday, January 29th, 2014, at 8:00 PM (8:30 in NFLD) on CBC Television! We're excited and hope you are too - please share away and spread the word! Updates to follow! 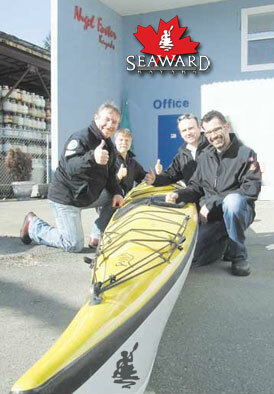 Rumor has it that Seaward Kayaks will be airing on the Dragons Den this coming January. What exciting news. To keep informed of this, please follow us on our Facebook page, where we will be sure to post once we know for sure!! Well, it's the an of an era here at Seaward Kayaks today. One of our longest serving staff members, Bill Murphy, is retiring after 19 years of service. Bill took great pride in his work, he specialised in outside seams, and we have him to thank for all those beautiful coloured seams on our kayaks. 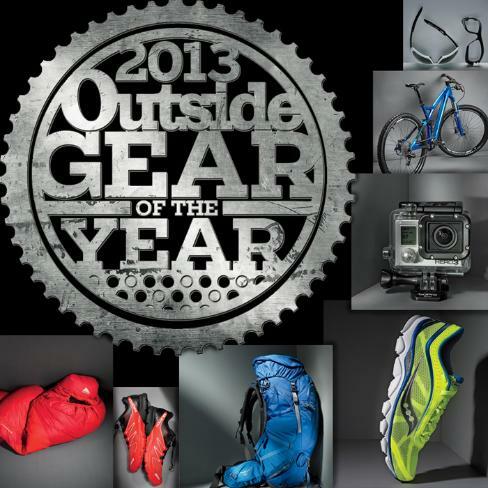 Outside Magazine 'Gear Of The Year Award' for Halo SR130 rec kayak! 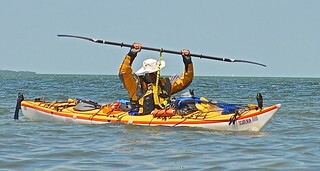 3 Seaward Kayaks finish the 300 mile WaterTribe's Everglades Challenge in 8 days or less. Andrew Woodford Doug asked me to write a quick blurb about who I am and where I like to paddle. I said sure, I’ll get that back to you quickly. The proverbial “quickly” turned into an interesting run down the rabbit hole and the question, what path should I follow..
Congratulations to Jay Raichura On Winning The Seaward Kayaks Photo Contest! Seaward Kayaks would like to congratulate Jay Raichura on winning the Seaward Kayaks Photo Contest. He edged out the competition in this great photo: Jay's honing his skills in prep for more challenging waters.... Port Browning, Pender Island. Brad of Kelp Reef Adventures in Victoria B.C. has unleashed his Nigrl Foster Seaward Legend in Victoria harbour. Heres the video to prove it. Watch as Brad of Kelp Reef Adventures makes himself a legend doing eskimo rolls Victoria's Harbour in beautiful B.C. 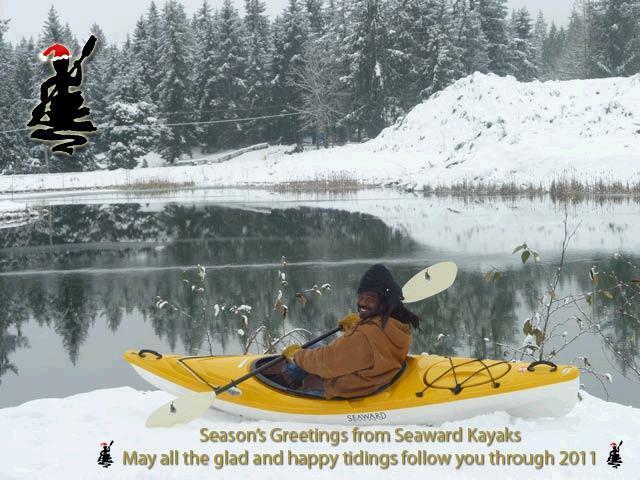 "Click here to watch Brad in action"
Seaward Kayaks wishes you the absolute best of the Holiday Season and a very Happy and Successful New Year in 2012 and Beyond! We will be closed for the Holidays beginning Friday December 23rd until Monday January 2nd 2012. We will be back to work on Tuesday January 3rd. Check Out the latest Youtube video from our good friends at Kelp Reef Adventures in Victoria BC Canada. "Brad Rolling His Seaward Kayaks Nigel Foster Legend In Victoria Harbour" Brad is paddling and rolling his Seaward Kayaks Nigel Foster Legend in Victoria Harbour. He has some finny friends folowing him around the harbour! Not to brag too much. 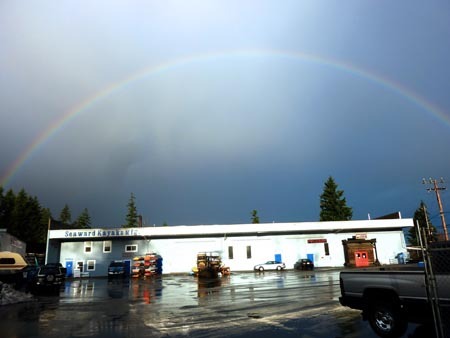 We found this blog by a customer that visited the factory a couple of weeks ago. 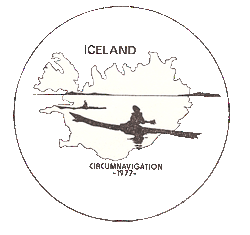 "Click here to see the Blog"
See Nigels circumnavigation of Iceland here " In 1977 Nigel Foster and Geoff Hunter set off to circumnavigate Iceland by sea kayak. It had never been attempted before. " Read Nigels blog of his experience here " Circumnavigation of Iceland "
Like Seaward Kayaks Here - "Seaward Kayaks Facebook page" It would be terrific to have you like us on Facebook. We are looking for new friends to bounce ideas off of. We'd like to continue communicating with our new and old patrons and develope some dialogue towards attaining the perfect kayak and kayaking experiences for and with you. Guess Who Won SeaKayaker Magazines Readers Choice Award ? From The Sales Desk: Why Choose a Seaward Kayak? Saturday,June 18th 10:00am to 4:00pm Mountain Equipment Co-Op Demo Day Willow's Beach, Oak Bay Victoria MEC Paddlefest is an urban celebration of all things paddlesport related. Whether you’re a beginner who’s never been in a boat, or an expert paddler looking to fine-tune your skills, there are plenty of learning opportunities both on water, and on land. Seaward Kayaks are happy to be joining up with Peach City Runners & Adventure Sports for a Demo Day Saturday May 14th from 10 AM ti 4PM. Peach City Runners & Adventure Sports is a specialty shop and source for all your kayaking, walking, running, triathlon, Nordic ski, climbing, and outdoor needs including apparel, equipment and community races & events. 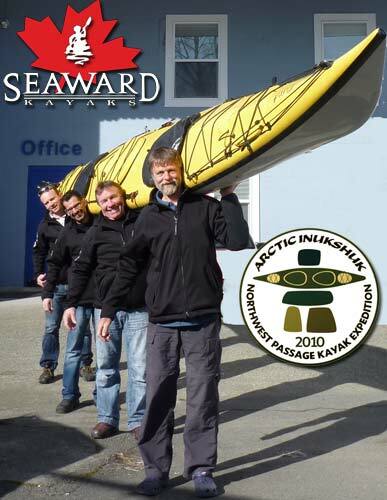 We will be in Kelowna with Inner Space Watersports on Sunday May 15th at Kin Beach From 10 Am until 4PM with the full fleet of Seaward and Nigel Foster Kayaks. Come on out and try them all! Check out Inner Space Watersports here "Inner Space watersports"
Seaward Kayaks would like to thank Hugh at Cowichan Bay Outfitters for the the great Demo paddle day this past Saturday at Coeichan Bay. A great time was had by all in attendance by all reports. All the best Hugh. That's right folks. You can Find the latest Amnik 14.5 TX review from Sea Kayaker magizine hot off the presses right here on our website. 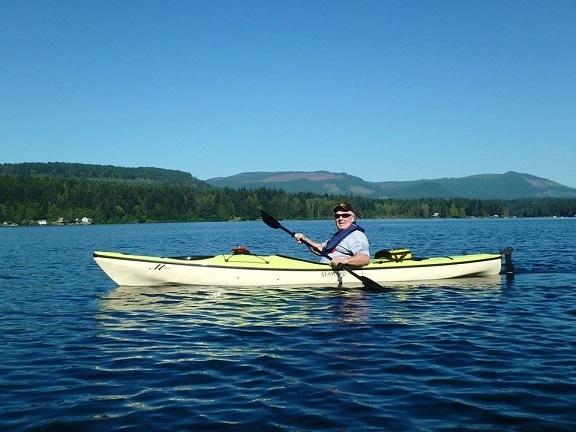 The Sea Kayaker Reviewers Are: JK: 5' 6", 150-pound male. Day paddle, calm. No cargo. GL: 5' 11", 165-pound male. Day trip, 5 to 12 knot wind, less than 1 foot chop. It is now easier than ever to find Seaward Kayaks Dealers and Outfitters with Google Maps. You will find the Google Maps for our Dealers and Outfitters on the left hand side of the page. Just scroll down the page a little and look on the left hand side click on the image and there you are. 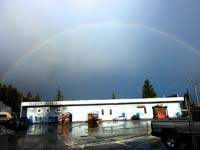 There's got to be something golden being made at our facilities in Chemainus. Could it be our finely Handcrafted Kayaks and the attention to detail that we put into every kayak that we build? The proof is in the boat. Go to a dealer near you and find out for yourself. 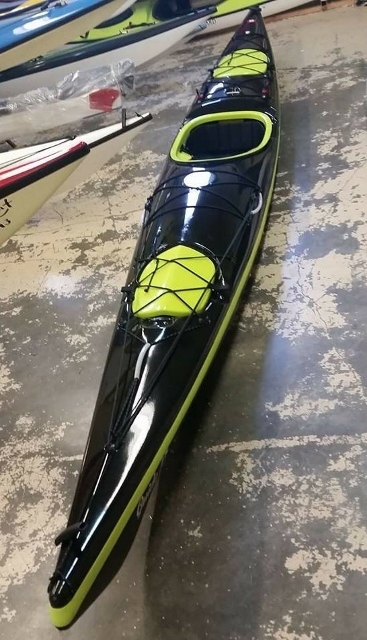 We have recently added X3 versions ( 3 hatches ) of our ever popular Ascente and Chilco Kayaks. The X3 versions will have a day hatch as a third bulkhead added to the two models as an option. Another great feature to an already proven line of kayaks! 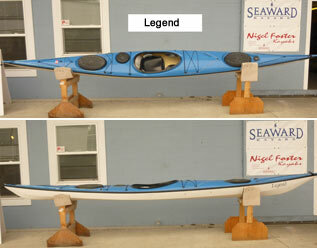 We are happy to annouce that we have some quality hand built Seaward demo kayaks for sale at the factory in Chemainus. To take a look at what we have go to In-Stock Kayaks and see what great savings you will find. You can customize the look of your Seaward kayak, including the deck, hull, seam, hatches and combing with a variety of colours with this new application that we are developing. 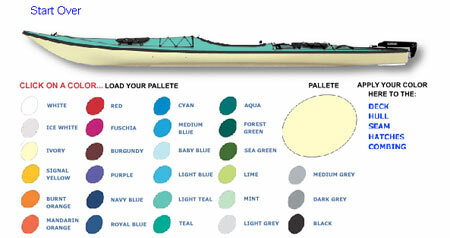 Use the Colour Your Kayak link "(Click Here);" to choose the colour combination you think best! Bruce Fuoco of Nanaimo B.C. 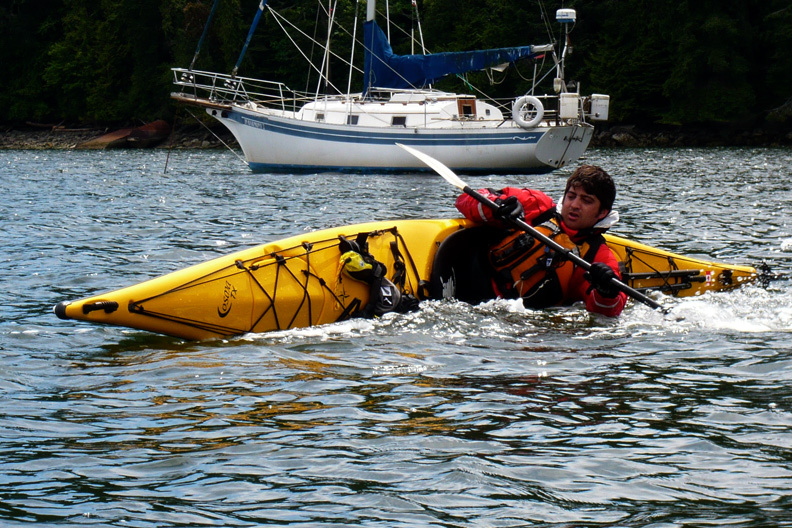 Canada designs adaptive kayaks for physically challenged folks. 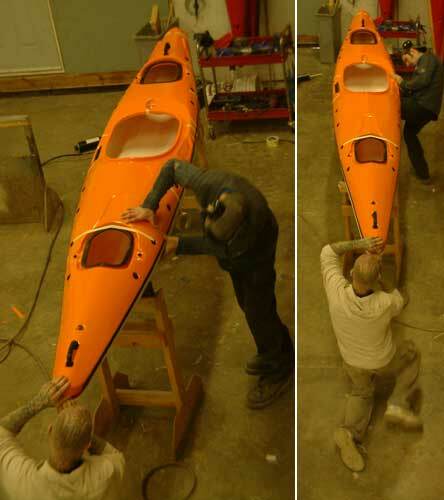 Over the years he has designed a number of kayaks using Seaward boats. 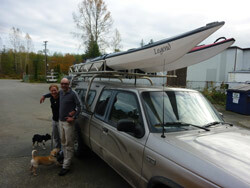 His latest designed kayak for us is a Seaward Kayaks Passage for one of our clients. For more information about Bruce try this link Bruce Fuoco Blogspot. A Couple OF Fan Letters From Our Patrons ! ANOTHER DAY AT THE BEACH..... We love a little humour at Seaward Kayaks; having said that we took this photo op of Francis without any gear on at the time of the photo. We do not recommend or condone going on the water without the proper safety gear. Be safe. Have fun. The New 14.5' Kayak is almost all there. The finishing touches are just hours away. The kayak will be water tested and away we go. Production here we come. Exciting times at Seaward. Don't forget to enter the name the Kayak Contest and Put a Name to That Face! 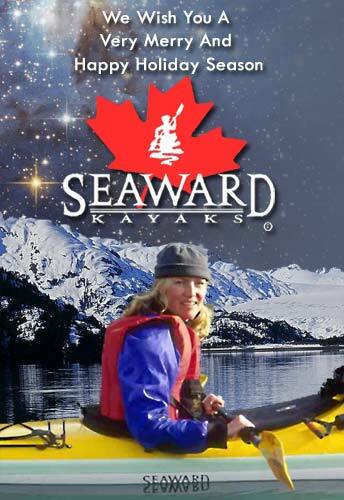 Seaward Kayaks is pleased to announce that we are now on Facebook. We would be delighted to have our Seaward friends join us on Facebook. We would be honored to have our friends share their Seaward Kayak pictures with us and the rest of the Facebook community. Seaward Kayaks "QUEST" is on the Front Page of Canoe and Kayak's December Magazine. We feel very pleased and quite fortunate to have Canoe and Kayak Magazine choose a shot with one of our Quest Kayaks on the cover. Wow! On the Cover: Sea Kayak Guide - Cory Denton at Mendenhall Glacier, Alaska.Photo by Robert Zuleski. Seaward Kayaks welcome Nick Longo as a sales and marketing representative. Nick will be assisting Glenn Lush in the sales department. 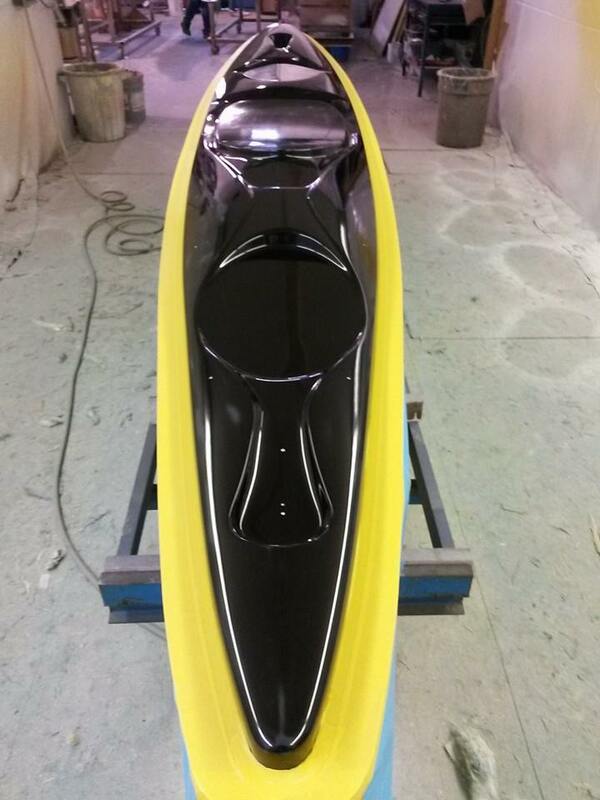 Nick will also be working on marketing Seaward Kayaks. We look forward to his contributions to the team. Welcome aboard Nick! The Chinook TX reviewed in Adventure Kayak Magazine's Summer/Fall Issue, 2009. Check it out under the Chinook TX section of our website. 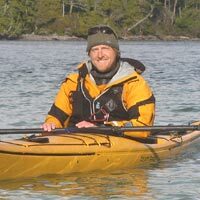 Glenn Lush has re-joined the Seaward Kayak sales team and brings with him years of kayaking experience! Welcome back Glenn. Feel free to call and welcome Glenn back. Passat G3 Voted Best Tandem by SeaKayaker Magazine Readers! Seaward Kayaks manufacturing and offices, will be closed for our annual vacation, starting on July 25th, returning August 8th. We hope you are all enjoying your summer paddling, and we might even see you out on the water!! !